On Friday I took the kids to our homeschooling group’s annual Lenten retreat. The theme of this year’s retreat was The Seven Sorrows of Mary. A young priest, Fr. Anthony Cusak, (himself a homeschool graduate) gave a meditation for the mothers that was just beautiful. As he spoke of the Flight into Egypt he referenced a painting at the MFA. I knew I needed to go look up the painting and also that I needed to go look up art to go with all the sorrows and to post them here with some of what I remember from his talk and some of my own thoughts and reflections. So here is the second of a planned series of seven posts. See the first here: The Prophecy of Simeon . So he got up, took the child and his mother during the night and left for Egypt. 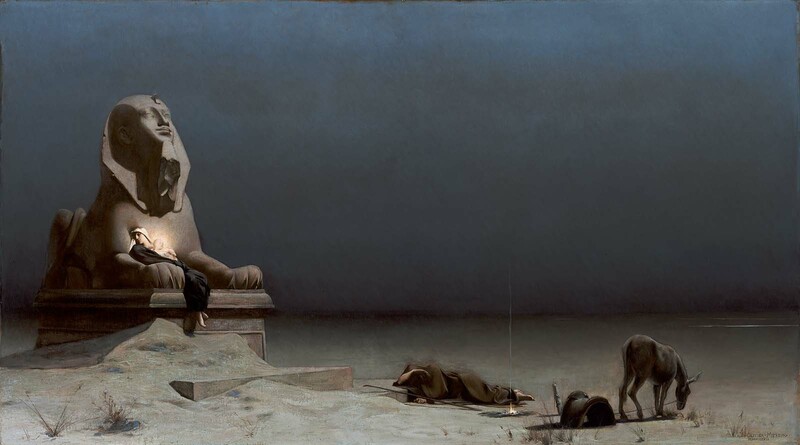 When Father Anthony mentioned this painting at the Museum of Fine Arts he specifically mentions Joseph sprawled, exhausted on the sand at the feet of the sphinx on which Mary and Jesus are resting. Joseph, exhausted from the journey, and probably from fear as well. 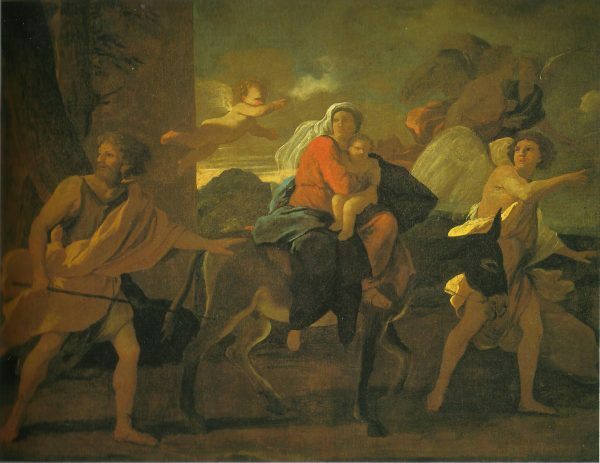 Fleeing from the horror of the slaughter of the innocents. I am so tempted here to write an entire blog post about this gorgeous painting and to ignore the mystery of the sorrow of Mary. But I will first drag myself away to ponder Mary’s sorrow as she lies there in the Sphinx’s arms. Or rides across the sands on her donkey or however else you might picture the Holy Family fleeing after the angel’s warning. Following in the steps of Abraham and Jospeh and Jacob, of all the children of Israel, Mary must fly into exile in a strange land where they worship alien gods. Leaving behind home and family to live among people with foreign customs and a foreign language. (Although, curiously, Anne Rice in her novel about the childhood of Jesus imagines that it’s not a nuclear Holy Family that flees but an entire clan, extended family accompanying Mary and Joseph and the child on their sojourn.) They leave behind the synagogues and the Temple, the Promised Land of the inheritance, to live in exile, trusting that some day God will deliver them and bring them back home. Her heart must have broken to leave all that behind, but I imagine especially hard to dwell in a place where the true God is unknown, to be surrounded by pagan idols. She carries with her the Light of the World but his time is not yet come and the nations do not know him or worship him. Only Mary and Joseph keep the light of faith alive in the land of Egypt. And I also imagine Mary’s heart breaking for all the women and children who could not flee, for the innocents slaughtered by the cruel king who would kill her own son too. All those babies, those grieving families. Surely Mary’s heart grieved for them too, she who bears the weight of all the sorrows of the world. And of course Mary’s heart is pierced by fear for her own dear child. He is born into a world that hates him and all he stands for. He is born to die. She knows from this early day how her son will be hated and feared and oh she fears what this cruel sin-filled world will do to him. In this fear she begins to see the outline of the passion and the cross. She sees the beginning of the shape of Jesus’ mission: to save the world from all the tyranny of sin and hatred and death. And now back to Merson’s beautiful painting. The first thing I notice is the Sphinx. Mary rests cradled between its paws, completely spent, with the child in her arms. (The nurses on the maternity ward would scold her for sleeping with the baby in such an unsafe posture.) Her head is turned into the stone arm of the sphinx as if she herself were a child sleeping in a parent’s arms. Her bare feet dangle. She is not the queenly Mother seated in majesty on a throne, but a tired mother worn out with the business of life. And yet the Sphinx’s form does recall a throne and that is surely deliberate. Here, even though they are collapsed with exhaustion, we still see the Christ as king enthroned and his position on the sphinx recalls the image of the psalm: “your foes I will put beneath your feet.” Jesus has come to displace all other gods and to call all the nations to be members of his Body. The Sphinx’s nose is broken suggesting that already the day of the Egyptians is coming to an end, the rule of those ancient gods is coming to a close. Also, the Sphinx is not like any standard Egyptian art, staring straight ahead with a fixed stare. Rather, its head is tilted to the sky, looking to heaven, turning to God. I lift up my eyes… from where shall come my help? My help is in the name of the Lord who made both heaven and earth. The baby glows in the darkness, the Light of the World, shining in the darkness. Here we already see the beginning of the fulfillment of Simeon’s prophetic song, Jesus as the light to reveal God to the nations. Nearby the fire is almost out, barely providing light. Joseph is too tired to tend the fire. Or perhaps the night is long spent and morning is near? A long line of smoke rising into the sky, reminiscent of incense and prayers. And where does the other light in the picture come from? We cannot see its source. The sky is dark, the desert is dark at night. Is it the full moon that is casting the shadows or is the first faint gleam of dawn? But never consumed or injured it. Nine months in her holy body. I am taken with the image of Joseph as Moses, the inversion of Joseph leading his family into Egypt even as Moses led his people out of Egypt. (Of course we know that later Joseph will lead Mary and Jesus out of Egypt and back to Nazareth.) Joseph, the last of the patriarchs reminds us of all of his predecessors, of their intimate relationship with God. The gesture of Joseph’s arm raised to hide his face reminds me that Moses hid his face after talking with God face to face on the holy mountain. Here is the Christ child, revealing himself, shining in his glory. Here is Joseph who has looked on the face of Christ. If Giotto’s Joseph is hidden behind a pillar, Merson’s Joseph, hiding his face from us and from the radiant child reveals more than is concealed. Lastly, consider the humble donkey, the staple of the iconography both of the flight into Egypt and of the journey to Bethlehem for the nativity. The Gospels never mention Mary riding a donkey; but I suspect the donkey is a foreshadowing of Jesus’ entry into Jerusalem riding on a donkey. The triumphant king entering into his city to acclamations of joy, only to be sent to his death days later to ugly shouts of “crucify him!” So much significance for one humble beast of burden to bear. This donkey looks tired too, its head is bowed as it grazes on the meager grass. It puts me in mind of the beautiful picture book, The Donkey’s Dream, in which the donkey dreams that he carries a fountain, a city, an entire world on his back. This donkey could also be said to carry all the sorrows of the world on his back. Mary’s grief now and to come. No wonder he looks so very tired. 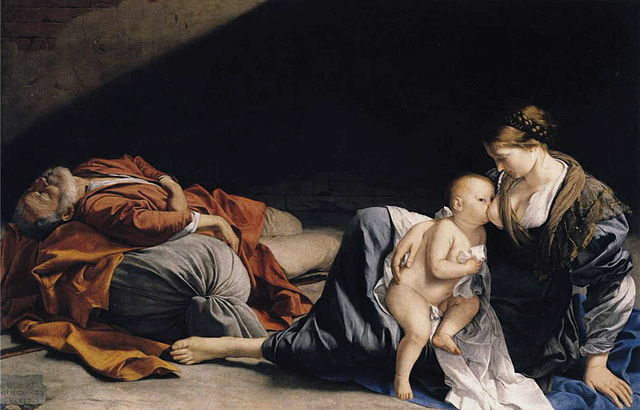 By contrast Gentileschi’s Rest on the Flight to Egypt is a calm, familial scene with very little in it to remind us of Mary’s sorrow. Yes, Joseph looks exhausted. He’s flung himself onto the pile of luggage to sleep. But the mother is completely absorbed in her nursing baby. The baby, who has been unwrapped from his swaddling bands, gazes directly at the viewer. His nakedness perhaps reminds us of his fleshiness– the Word became flesh. How vulnerable God became when he humbled himself to take on our human nature. Perhaps it also prefigures his nakedness on the cross when the soldiers have stripped him of his garments. 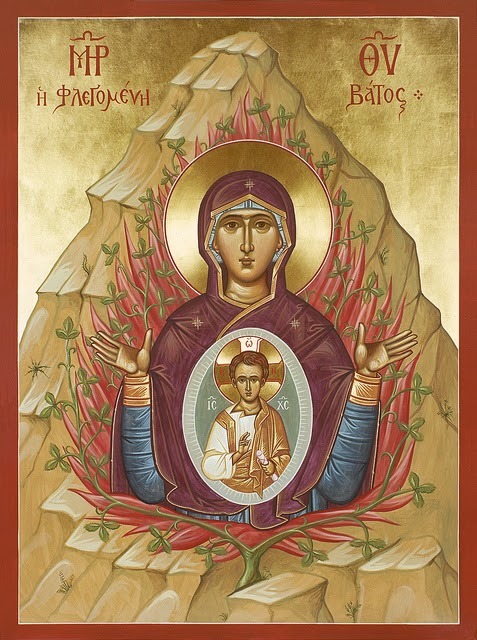 A dark shadow hangs over the family’s heads, though, and the Virgin, poised as she is, sits on the bare ground, propping herself and the baby with one out flung arm. It’s an uncomfortable in which position to sit and nurse a baby, with nothing behind her back for support; but nothing in Gentileschi’s composition reminds us of her probably discomfort. It’s a sweet vignette, that reminds me that even in the midst of her sorrows, our Lady still found islands of calm and peace to contemplate her child and to enjoy his babyhood. This is another painting in my own dear Museum of Fine Arts in Boston. I was not surprised to learn that Aert de Gelder was one of Rembrandt’s pupils because at first glance I wondered if this piece might be a Rembrandt. This is such a beautifully tender painting. Mary is nursing the baby; or, rather, the baby seems to have just fallen asleep while nursing. Mary and Joseph both look tenderly down at the figure of the sleeping baby. 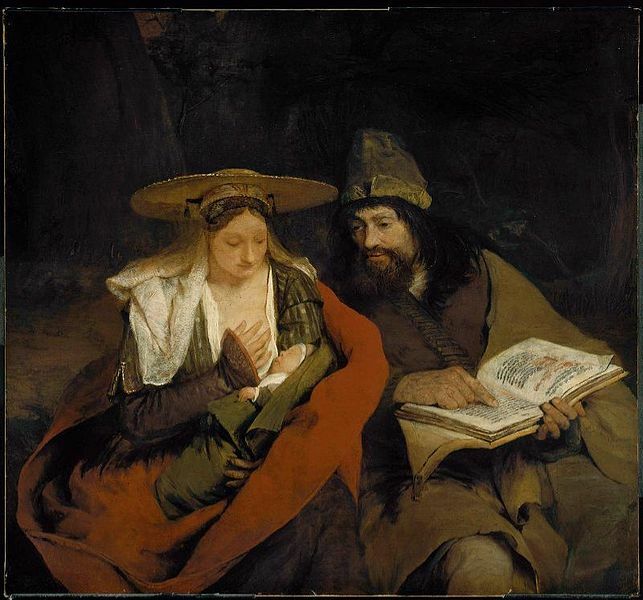 It seems that Joseph has been reading to Mary during their rest stop, the book is still open on his lap and his finger marks his place on the page. Or perhaps, the MFA’s site speculates, the finger is pointing to a prophecy about the Messiah. Certainly I can’t imagine the book is anything other than Scripture. And so it is that Joseph turns away from the word, which he as a holy and righteous man has been contemplating all his life, to gaze in turn on the Word made flesh. Jospeh’s face seems full of wonder. Mary looks contemplative, peaceful. What secret thoughts do her downcast eyes conceal from us? In none of these three paintings do I discern directly an icon of Our Lady of Sorrows. Painters of the Flight to Egypt tend to focus on the familial, on Mary as nurturing mother. And yet, isn’t that how it often is? I meet someone on the street, I greet a friend or a co-worker or a family member and they smile warmly at me and return my greetings and I have not the least idea what secret sorrows they carry hidden deep within their breasts. To me these paintings are an icon of the hiddenness of grief and a reminder that I can’t know what burdens others carry. Mary keeps all the words she hears and ponders them in her heart. I’ve always thought of that pondering as a sort of peaceful contemplation, but now I wonder if Mary’s pondering was a sort of silent wrestling with God. And as we shall see when we ponder the finding of the child in the Temple, she is not always silent about her worries. I end with a painting by Poussin from the Worcester Art Museum that in its energy and motion is very different from all the others I’ve shared, which depict the Holy Family’s rest on their flight. In this painting Saint Joseph, Mary, and the angel who guides them, are all turning to look over their shoulders. It was that backwards glance that arrested me and had me coming back to this picture again and again. The backwards glance recalls what they are fleeing from: Herod’s wrath and the slaughter of the Holy Innocents. They are moving in haste and great fear, accompanied by four angels. The scene recalls the Israelites’ flight from Egypt as well, led by God in the form of the pillar of fire, looking back at the pursuing Egyptians. Is the Holy Family fearful of pursuit? Are they haunted by the cries of the dead and dying babies and the wailing of the mothers?
. . . the small putto who flies behind the head of the Virgin Mary; this figure surely symbolises the Holy Innocents from whose slaughter Joseph and his family are fleeing. As the infants were the very first martyrs to die for Christ, and Mary represented Ecclesia, the Church, it is fitting that this putto should accompany the Virgin, and give the impression that it is about to crown her as Ecclesia, for whom it has died. I’m don’t love that this interpretation furthers the theological error that people become angels when they die, but painters are not theologians and I do think it makes the most sense of this particular painting. In this painting Mary’s fear is palpable as she clutches the child close. Even as he looks behind, Joseph reaches a hand towards Mary and the baby. Is it a calming gesture, a protective gesture, or is he swatting the donkey’s flank to get it to move faster? Everything in the painting says haste and speed. This is the storm before the calm the other paintings portray. Though I’m putting it out of chronological order, there’s something satisfying about leaving on this note of haste and fear for, after all, we are not contemplating Mary’s tenderness but her sorrow.